Everybody loves Blu-ray movie. Its resolutions and sound quality are second to none. However, DVDs are space consuming and not convenient to carry around. It can be easily damaged by moisture or heat. 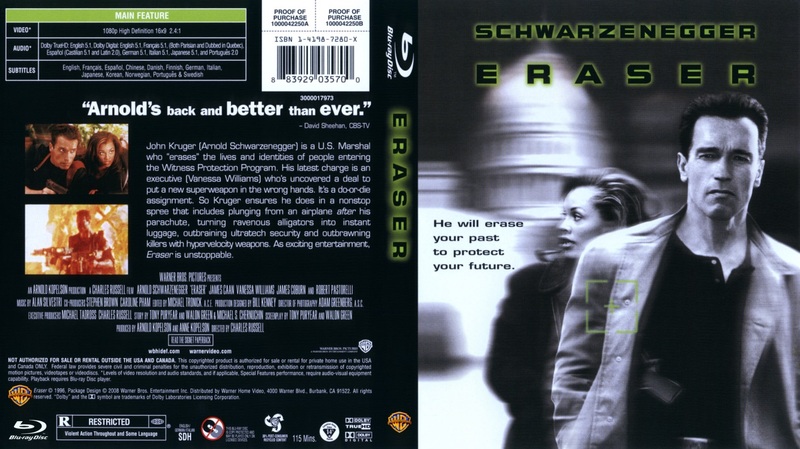 For no matter what reason, we want to back up Blu-ray DVDs, aren’t we? To do so, you need a Blu-ray ripper. It can help you digitalize Blu-ray movies in lightning speed. There are many Blu-ray rippers available on the market. Each has different features. Now let’s take a look at the best Blu-ray rippers of 2017. As one of the best Blu-ray ripping software, Leawo Blu-ray Ripper could rip and convert Blu-ray to video and extract audio off Blu-ray to save in all formats for any media player and device. It could rip and convert Blu-ray to MP4, Blu-ray to MKV, Blu-ray to AVI, Blu-ray to WMV, etc., and extract audio off Blu-ray/DVD to save in MP3, AAC, FLAC, etc. More than 180 video and audio formats are supported for output. What’s more, Leawo Blu-ray Ripper could even rip and convert Blu-ray to 4K/1080P/720P/regular video to let you fully enjoy Blu-ray disc on 4K TV, 1080P displays, or mobile devices. 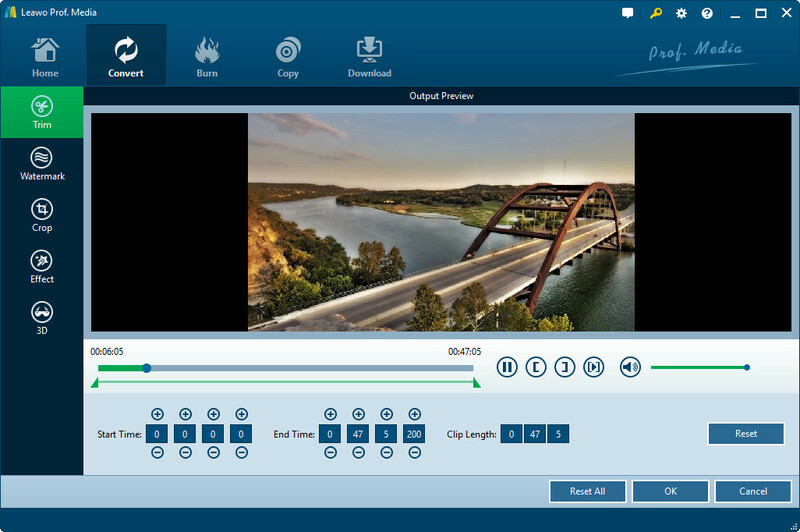 With this Blu-ray ripping software, by ripping Blu-ray to video, you could easily watch Blu-ray movies on any media player and mobile device, like Windows Media Player, QuickTime, iTunes, iPhone, iPad, Android smartphones and tablets, Surface, Xbox, etc., edit Blu-ray in video editing software like Windows Movie Maker, and/or upload Blu-ray movie to YouTube or blog for sharing. This Blu-ray ripping software could also rip Blu-ray and DVD, be it commercial or regular. Featuring quality-lossless Blu-ray/DVD conversion tech, Leawo Blu-ray Ripper offers cinema-like movie experience for you with your home theatre system. Keep all elements in source Blu-ray/DVD content after conversion, without any quality loss. With advanced graphic accelerating technologies and batch conversion support, Leawo Blu-ray Ripper can rip Blu-ray/DVD and handle Blu-ray/DVD to video conversion faster than rivals. The program is extremely easy to use, no tech knowledge required. 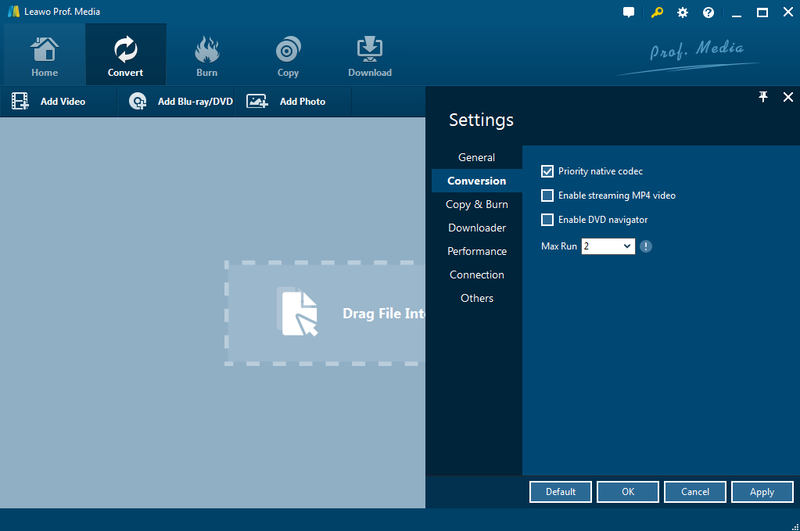 Step 1: Download and install Leawo Blu-ray Ripper on your computer, and then kick off the program to enter the home page as shown below. Step 2: Settings. Click Settings icon on the right up corner to set language, conversion specification, performances, etc. Step 3: Introduce source video for ripping Blu-ray movies to MPEG. 3 options are available: Under Convert button, you will see two drop down boxes that say Add Video and Add Blu-ray/DVD. 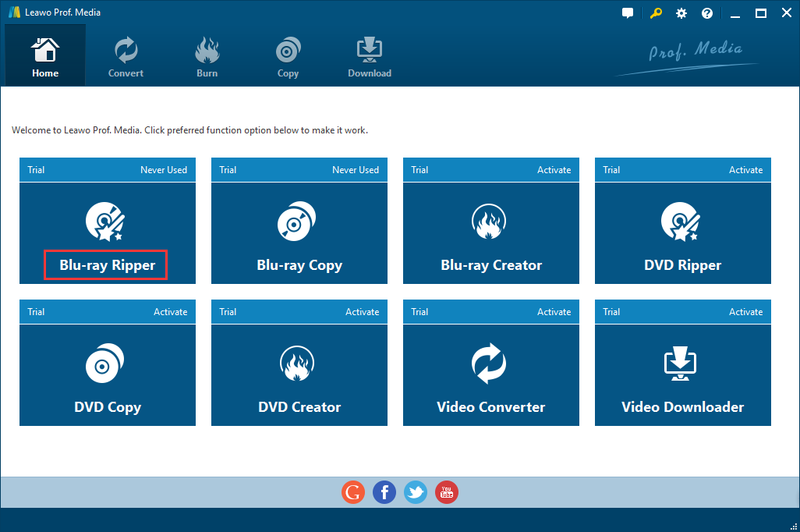 You can add video or video folder by clicking the Add Video button; you can add from CD-ROM (you need to insert Blu-ray DVD into the CD-ROM beforehand), add from folder or add ISO file by clicking Add Blu-ray/DVD; or you can drag file directly into the program. Normally, you do not store a Blu-ray video on your computer because it’s too space consuming. But you can always use Blu-ray DVDs to make the conversion. 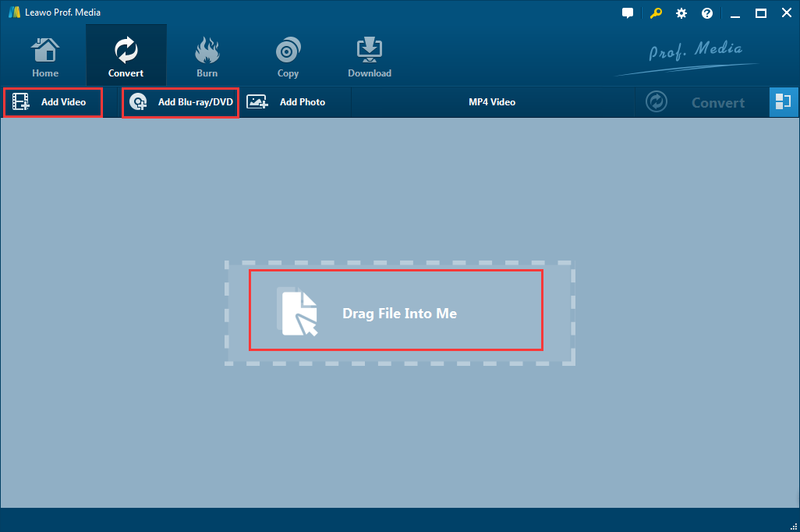 Step 4: Set the output format before ripping Blu-ray videos to MPEG. The default setting is MP4 Video. 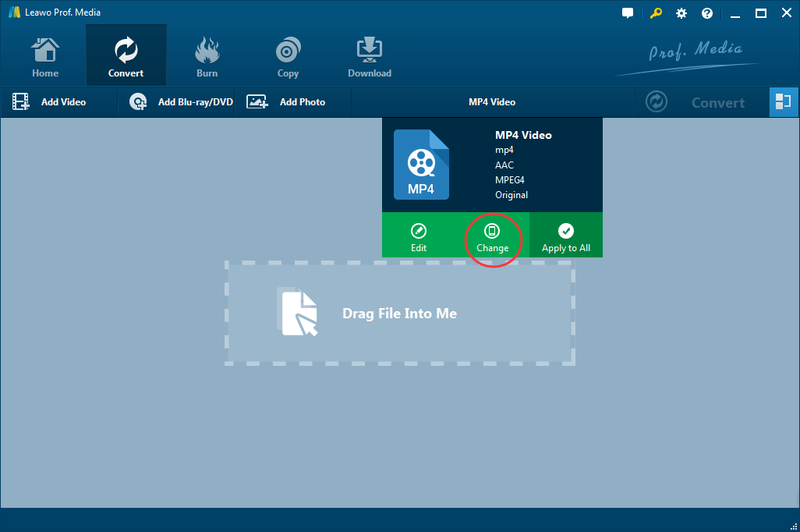 Click the drop down box MP4 Video and then click change to launch a new interface where you can choose output format and device. Step 5: Start converting Blu-ray videos to MPEG. Several conversions can be made at the same time. With advanced disc protection removal technology, Leawo Blu-ray Ripper could decrypt, rip and convert Blu-ray discs with AACS, BD+ and the latest MKB protection, and CSS-DVD discs. Step 6: Editing after conversion. Leawo Blu-ray Ripper enables you to personalize Blu-ray/DVD movies before or after converting to get more enjoyment, including: file merging, media editing, 3D movie creating, parameter adjusting, etc. You could make movie with your own patent easily. The bad: It does not support Blu-ray ISO or BDMV structure. There’s no option for preserving only forced subtitles. Freemake is one of my favorites, because it has never once screwed up anything I have thrown at it. You just need to insert the disk, point Freemake towards the disk’s folder, decide what format you want it converted to, and Bob’s your uncle. You can even join up files to have one big merged file. Videos can also be converted to Flash or HTML5, as well as MP3. WonderFox Free DVD Ripper Speedy is a free app that will allow you to convert your DVD collection. The app is really simple to use and has a fresh user interface that is intuitive and well structured, although a little basic. It supports to convert the popular DVDs to AVI, MP4, MKV, MOV, WMV, MPG, iPhone, Android cell phone and more. If I have to choose one from the 2017 5 best Blu-ray ripping software, I choose Leawo Blu-ray ripper. Not only does it have versions for Mac and Windows but also has many audio and video formats to choose from. It can rip Blu-ray movies to multiple devices and can burn them to DVD. On top of that, it has a lightning conversion speed as well as various editing features. In short, Leawo Blu-ray ripper is your best choice for ripping Blu-ray movies. Wanna check the best list back in 2016 for comparison? Sure, here it is the best Blu ray ripping software in 2016 for your reference.